When Blessed John XXIII canonized Peter Julian Eymard on December 9, 1962, at the close of the First Session of the Second Vatican Council, he was, I think, acting prophetically. He directed the eyes of the universal Church to the image of a priest-adorer impassioned by the Most Holy Eucharist. During the pontificates of Pope John Paul II and Pope Benedict XVI, marked by the abundant graces of the Year of the Eucharist, Saint Peter Julian Eymard's particular expression of sacerdotal holiness came into focus more clearly for me. Saint Peter Julian was a priest for priests. In every brother priest he recognized a living image of Jesus Christ. He was known even to leave his prie-dieu before the Blessed Sacrament during his designated hour of adoration in order to receive a priest in need. Père Eymard ardently desired to do still more. In the first place, he resolved to number among the chief Apostolic Works of the Society of the Blessed Sacrament that of receiving into its Sanctuaries of adoration all priests who might desire to spend some days at the foot of the holy tabernacle. "Sanctify the priests by the Eucharist," he wrote. "That embraces everything. With the priests, we have the parishes, the whole country." Some months before his death, he exclaimed, "Now listen! I want to get the priests. That is our principal apostolate." "To labour for priests," he used to say, "is to labour for multipliers. Let the Holy Eucharist become the centre of their thoughts, the end of their labours, and they will have at their disposal the most efficient means for the conversion and sanctification of their people. Let them find in Jesus of the tabernacle a Friend in their loneliness, insurmountable strength in their struggles, constantly renewed vigour in their weariness, for He is the Source of grace, which produces abundant fruits." Saint Peter Julian entertained the idea of founding a society of diocesan priest-adorers, not unlike the Oblates associated with monasteries: "I want to form . . . secular priests, to bind them together by prayer, by determinate statutes, and to sanctify them by the Blessed Sacrament of the Altar. This work is ours, but I do not want to undertake now on a large scale. Oh, when will the time come! Priests sharing in the life of the Blessed Sacrament, should live according to the Eucharistic life of Jesus, which consists above all in self-abnegation and the love of sacrifice. . . . They should perform all their duties under the protection of the Blessed Virgin, the Adoratrice of the Cenacle, for through that sweet Mother we more easily approach Jesus. Their studies, their energy, and their piety they should direct to the Blessed Sacrament of the Altar. They should bear in mind that adoration is their chief duty: Nos autem orationi instantes erimus -- But we will give ourselves continually to prayer" (Acts 6, 4). 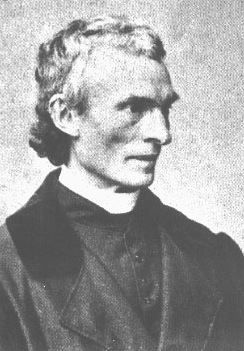 For Saint Peter Julian Eymard, Eucharistic adoration was the soul of the ministry of holy preaching. "Like Moses," he wrote, "full of zeal to announce the teaching of the Divine Master when he came down from Mount Sinai, like the Apostles coming from the Cenacle, so should the priests [of this Society] go from the church straight to the people to announce to them the Word of God: Et ministerio verbi -- to the ministry of the Word (Acts 6, 4). A priest who seeks first the Eucharistic Face of Jesus, and has learned to linger close to His Eucharistic Heart, will be given all other things besides. His ministry will be prodigiously fruitful, even if, in this present life, its fruitfulness remains hidden. The priest is the friend of the Bridegroom, pointing souls to the tabernacle and, even more, inviting them to follow him into the radiance of His Eucharistic Face and the warmth of His Open Heart. Saint Peter Julian says it this way: "They should bind themselves to defend always and under all circumstances the interests and the honour of Jesus Christ, and by every possible means to multiply visits to the Blessed Sacrament as well as frequent and daily Communion. In a word, in all their actions, they should unite with Jesus in the Blessed Sacrament, the Eternal High Priest, the Model of the grace of the priesthood."